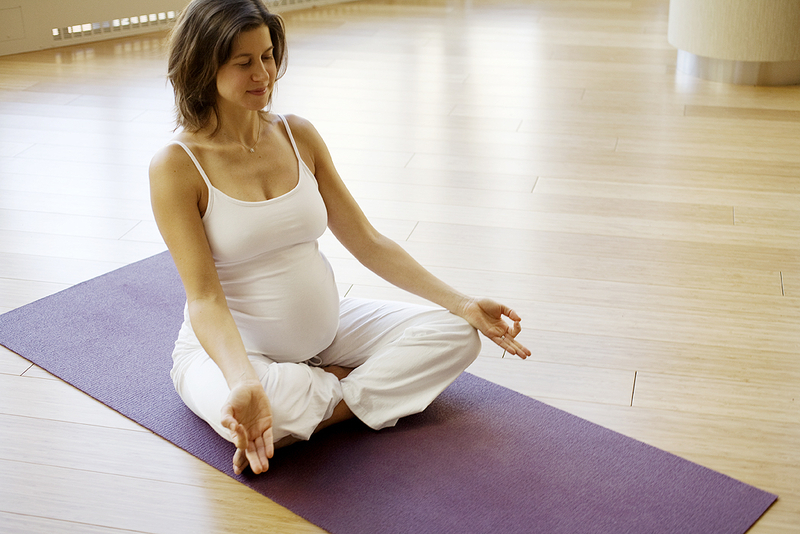 Begin and end your prenatal yoga session with gentle breathing. Focus on taking a deep breath in and a slow breath out. Never hold your breath. Inhale count for 1-2-3-4-5, pause briefly, exhale count for 1-2-3-4-5. Visualize the breath creating a peaceful environment for your baby. Circling the Belly Connect with the energy of your baby and increase the healthy prana by circling your hands around the belly in a clockwise motion. Continue circling and if you choose you can also go in a counter-clockwise direction for the same count. Holding either your ankles or shins allow your upper body to freely circle around while focusing on stretching your back and sides. Go around several times in one direction and then go in the opposite direction. Inhale let belly descend, lift your chin, focus on opening chest forward. Exhale round upper back, tuck chin to chest. Create an upside down V shape. Place hands at shoulder width distance. Feet at hip-width distance. Breathe and stay for as many breaths as comfortable. Repeat throughout sequence. Balance! Enjoy the new sense of equilibrium. Place one foot up on inner thigh (or lower on ankle) of opposite leg. Use a wall to assist with balance if necessary. Attempt to stay for 5+ deep breaths. Focus your eyes at one point to help with balance. Go slowly with this pose if you are new to yoga. Rest on knees at hip width distance. Place hands on lower back. Lift your chest up, look up or forward, focus on breathing into chest and lifting heart away from pelvis. (Having an experienced teacher with you to assist can be nice!). Sitting with feet together or legs spread open reach one arm up and over. Focus on lifting ribs and opening chest as you bend to side. Repeat to other side. Support heels by rolling up a blanket, towel or mat and placing under heels (not pictured). Spread feet wider than hip width (and go wider as the belly gets bigger). If you do not support heels you may need to lift them off floor to get all the way down. *Avoid if baby is breach if you are beyond 32 weeks. Rest fully on left hip. Engage legs, push through feet and line up upper hip directly over lower hip. Place left hand as far away from body as necessary to get stretch through side body. Rest left ear on left shoulder. Breath deeply and slowly into ribs. Stay for 5-10 breaths. Place one foot forward with knee bent and aligned above foot. Lengthen lower back. Stay for 5-10 breaths. Change legs. In a seated position stack your shins so that one foot aligns over the opposite knee and vice versa. 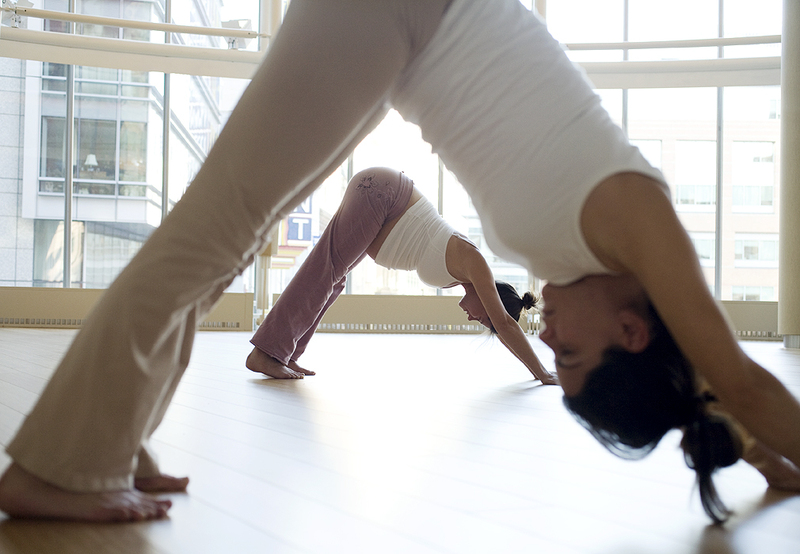 Breathe in lengthen spine, breathe out lean forward over shins. Stay for 5-10 breaths. Change legs. Extend one leg. Bend knee of opposite leg and place on inner thigh. Twist away from extended leg. Breathe in lengthen up, breathe out twist more for 5-10 breaths. Change legs. Enjoy this prenatal yoga sequence. Photos courtesy of Kim Lowe.